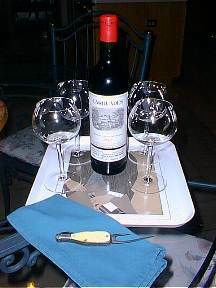 On June 11, 1997 Rosalie Weinberg gave me a bottle of 1967 Carruades Chateau Lafite-Rothschild. She told me to use it for a special occasion. Something special did happen! On Saturday, June 21 I went to a knife show and found something that has been on my want list for several years - Korn's Patent! That was cause for celebration! On February 8, 1883 George W. Korn of New York was granted German patent number 21125 for his "Korkenzieher." On August 28, 1883 Korn received U. S. Patent Number 283,900 entitled "Cork Turner." This "Champagne" Bottle knife contains the Cork Turner. The knife blades are marked HENRY SEARS & SON 1865 (the year founded). A foil cutter is at the top. Korn's Patent is the two prong blade which is marked in a rectangle KORN'S PATENT. 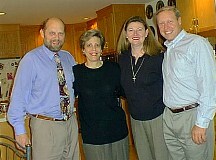 The Korn's celebration took place the evening of June 24. Present for the opening and tasting as guest of Don and Bonnie Bull were new ICCA member John Morris and his go-with Martha. The long prong is carefully slipped in beside the cork until penetrated by the short prong. Four serrations on the long prong just below the point on the short prong engage the cork. 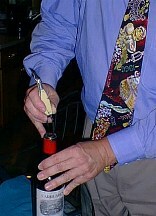 A twist to break the cork free from the bottle wall and a long, slow pull will nicely draw out the cork. Voila! Korn has done his job. 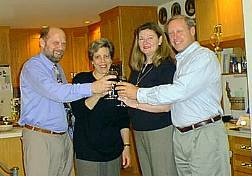 A toast to Rosalie and our dear departed friend Ted Weinberg, new ICCA members, good times, good wine and George W. Korn. For more on the Korn's Patent go to The Korn's Patent Mystery.